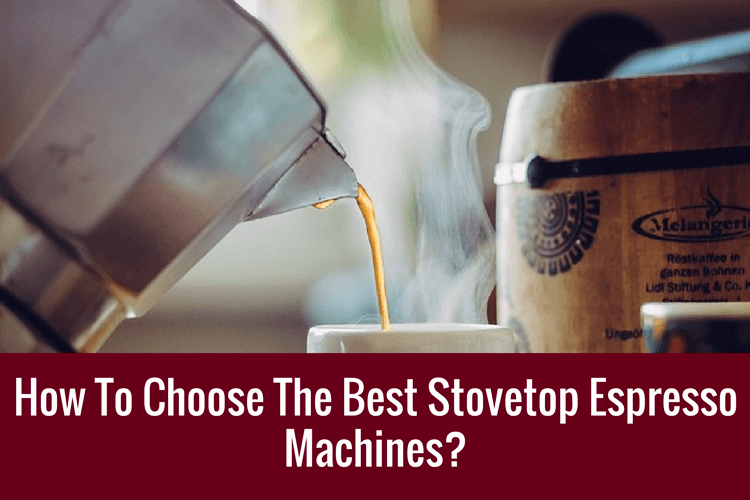 [GUIDE 2019] How To Choose The Best Stovetop Espresso Makers? How To Choose The Best Stovetop Espresso Maker? “Oh, I wish coffee tasted as good as it smells!” I’m sure you have heard that phrase many times before. If you yourself have thought this then you might want to give “café” espresso a whirl. Connoisseurs and enthusiasts alike have conferred it the ”best drink in the world”. Maybe you have already tried espresso and now you’re on a mission to find the best espresso maker that will produce that rich divine flavor that you so crave. This time, we are going to walk through one of the methods to make espresso - the stovetop brewing method. Why Should I Choose A Stovetop Brewer? Technically, stovetop makes good, strong coffee but it is not called “espresso”. It is really a misnomer. That is because moka pots generally do not have 9 bars of pressure. Stovetops makers are preferred over more sophisticated machines because it is the opposite of what they are - simple. It generally has no moving parts except for the lid. This makes cleaning a whole lot easier. With simplicity, comes savings. These classic makers does not break the bank; does not cost much to replace. Stovetop brewers are a very economical, smart choice. Making a good cup takes less than 8 minutes. Getting the perfect cup though, takes some practice. What Are Some Wonderful Things About A Stovetop Brewer? Most stovetop brewers are super easy to maintain and clean. Plus, you don’t have to use filters or buy k-cups like you do with a drip machine or Keurig. If you purchase a stainless steel brewer it will easily outlast most plug-in coffeemakers. You can also use it outdoors as well. Not having to lug around a 10kg machine really makes a lot of difference. With these pots, you won’t be deprived of your daily fix even when you go camping or traveling. How awesome is that? Also, most stovetop brewers are pretty small, look great and don’t take up much room in your kitchen. How Does A Stovetop Brewer Work? If you are new to this. This is how it works. Imagine that there are 3 chambers. The water chamber at the bottom, ground chamber in the middle and brew chamber at the top. Don’t ask me the reason for some of the terms. i simply made them up for illustration. Preparation work includes placing water is placed into the bottom chamber. The coffee grounds (coarser than espresso grounds) are placed on an elevated, perforated middle chamber. The device is subsequently placed on a heat source. This will boil the water, forming steam and pressure. The pressure will force water up a funnel into the middle chamber full of the grounds. The brownish liquid will then escapes through a metal filter into the a holding area before getting push through another funnel into the top chamber. There! Your brew is served. What Should I Look For In Stovetop Brewer? Most moka pots are similar. But, I will still go through what you should look out for. I would consider a stainless steel or aluminium for durability. Although it is relatively inexpensive, you should still get one that will last you a very long time. The other consideration is the material of the handle or how insulated against heat it is. During the brewing process, the handle could get really hot, getting a burn should be the last thing you want. They usually comes in a silver finish. But, they usually comes in different shapes. Some spherical -looking, others; with more edges. You are likely to use it a lot so you want it to look nice on your counter as well. Some model works with only gas stove. These days, it is more common to find induction stoves in homes. So, do remember to check this out. To help you with your search better. Let’s take a look at 5 moka pots that we think is going to be up to the task. The iconic Original Bialetti Moka Express. It is made in Italy, serves up to 9 cups of espresso and comes in silver with a patented valve. This one of a kind classic unit has a patented safety valve which keeps over pressurization of the lower water chamber from occurring. Of course, this gleaning aluminium moka pot is designed in the classic Bialetti eight-sided octagon shape which helps to diffuse heat. You can be sure your getting quality because Bialetti Moka has been making this classic design for over 80 years and produces the richest finest espresso in just a few minutes. Just like any other items Bialetti's can have corrosion develop over time in the inside but if you clean it very regularly, it should be able to last you for a long time. In addition, this moka pot is that is has a side-pour spout for simple pouring. The rubber handle is well-designed to keep the heat off your palm. The top flips up with an easy to grip knob. Minos has a long history of making moka pots. This espresso maker is not only nice-looking and can only brew a good cup of strong coffee. This modern elegant pot has a streamlined beautiful design since it was first developed in 1933. Additionally, this classic pot has a petite rim at the top which prevents you from spilling and makes it much safer to use. This, too, has its’ disadvantage. The smaller rim makes it harder to clean. I would recommend that you use a strong cleaning agent to rinse the pot to ensure that it is clean. A brush with a “slim” stem will do the trick too. This moka pot is made from stainless steel, which is built to last. One feature of this product is the ability to customise the handle color. It may not seem to be too much of a deal, but it does save you a little cash if you need to replace it. On top of that, the different colors will allow you to match it to your kitchen, making sure it won’t be out of place. The functional Minos Moka Pot is created to be easy to use for anyone. It does makes a great starter for people who are looking to get one. If you still remember, we discussed about how important the handle is. That is reflected in this product design. This Stovetop espresso maker comes with a very good heat resistant, easy to grip matt polypropylene handle which will not scald your hand. Not to mention, it fits very comfortably in your hand. As we progress with time, this moka pot does too. You can use this moka pot on electric, ceramic and gas stove tops which should fit most, if not all, modern kitchens. This product comes with a variety of colors. You can get it coated matt black, aluminum, stainless steel or matte stainless steel finish. Surely, one of it will suit your style. We want a good brew and we want it fast . This stovetop brewer takes around 5 minutes to make your coffee. If you wanted to save more time, this is it. The first great thing to note about this product is that it is fully made with stainless steel. The core is also made with stainless steel. There is no coating or otherwise. This should be able to set the health-conscious at rest. This product is also easier to clean as the inside are round. This espresso maker comes with an extra gasket and reducer which will come in very handy when you need to replace them. Even though it is not made in Italy, this maker comes in several different sizes and is made of extremely high quality and high durability. Not a fan of leakage? So are we. The silicon seal prevents water from leaking out during the process. If there is anything that we think could be improved on would be the handle. The handle is also made of stainless steel but there is no exterior rubber coating or sorts. Do be careful in handling it after the brew. This stovetop maker itself looks like a piece of art and will certainly catch anyone’s attention and curiosity. This product is the baby of a partnership with Italian companies. You would notice that the bottom is relatively broader. This is to prevent accidental toppling of the pot. This moka pot has a distinctive boiler design that prevents the filtering of the grinds at just the right time so that you don’t have to deal with the last phase or “eruption phase” of the brewing process that can sometimes give the coffee a burnt aftertaste. Another feature of this fanciful espresso brewer is that it has a very unique “V” shape spout and is designed this way to cut the drop when pouring. One thing to note is that this maker does not have a “window” at the top. So you would not be able to see the process. The handle is quite far from the body, so you would not scald yourself accidentally. In addition, this product is not designed for induction stoves. So you would have to use a gas stove. Hopefully, you would have learned quite a bit from this. Moka Pots have a long heritage, before modern espresso machines come into play. The fact that it still exists today must have its merits. Out of the 5 products, I would suggest to consider getting the Italian Bialette Moka Stovetop Espresso Maker. To start with, this product is made in Italy, home of espresso. Possibly, it would be safe to think that their craftsmanship and skill is top notch. Espresso making skill is a result of persistence and patience. With practice, you will be whipping up a good cup of coffee that rivals those even in your local coffee shop. Till then!